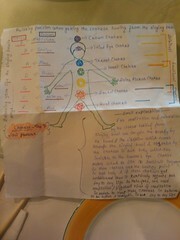 Chakras are also known as energy centers within the body. When people use the colored chakra stones in combination with meditation it is believed that the body will be replenished and the energy reserves will be restored. More simply put, those that follow this will be better able to fight off stress, get better and longer sleep and it will also increase their energy levels. The power points line up and down the center of the body or near the spine. If unbalanced or blocked, physical and mental health will be distorted, it will also effect spiritual growth. There is an electromagnetic field that is around the human body, called the aura. It indicates the spiritual, mental, and physical health of a person. If the colors are bright and clear then it is assumed that their health is good. Darker colors that may appear murky or unclear indicate a negative health of body, mind, and spirit. This chakra is located above the head. It links an individual to the universe. The pineal gland, the brain, and the central nervous system are all associated with the Crown chakra and is the primary center for coordination. When the chakra is balanced it will create harmony and balance on an emotional level. When the crown chakra is unbalanced there are coordination difficulties, poor balance often associated with clumsiness, the inability to produce new thoughts, and a lack of spirit.